I spend a good portion of my life in my office, which sits on the corner of our building, just off the letterpress studio. Here's a few of the things kicking around my desk which are important in some way to my work. 1. Reference books. As well as phone and address books, I keep a few important volumes within reach: The Oxford Canadian Dictionary, Robert Bringhurst’s Elements of Typographic Style, and Carl Dair’s Design With Type. Also on this shelf are a few type catalogues (like the one from my friend Patrick Griffin’s Canada Type) and some sewn signatures made of different weight papers for estimating spine thickness. 3. Pica rulers, squares and French curves. 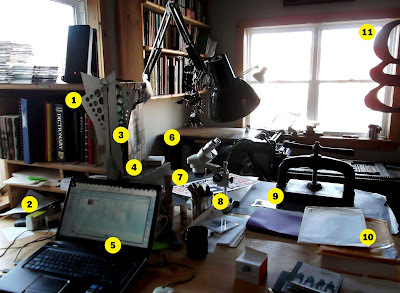 I grew up at a drafting table and have one in my office, directly behind the camera position. I still occasionally find drawing the quickest and easiest way to work out an idea, though I use it more for cutting than drawing most days. 4. Litho stone. a gift from Jack McMaster. 5. Not a Mac. It’s actually an HP Pavilion dv7. (We’ve always been a Windows based shop.) I designed my workspace around a 5.5 foot square counter-height table placed in the middle of room because I didn’t want to spend my life sitting in a corner. 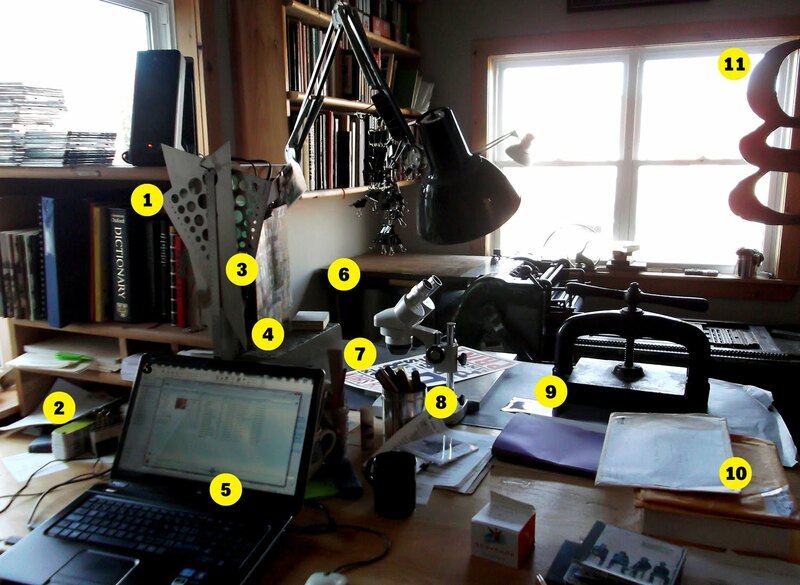 I wanted to look into and across the workspace. I can work standing or sitting. I also abandoned my desktop and went to using a laptop exclusively. I soon got tired of moving back and forth between a large and small monitor depending on where I was working, so I ditched that too. I’m less reliant on seeing what I’m setting than I used to be, as I have a pretty good sense by now what it looks like when I set 23 pica lines of 10/13 Quadratt on an 5 × 8 inch book page, or whatever. I can see that in my head, and it’s all conjecture until you study paper laser proofs anyway. The only time I miss the large monitor where I can spread things out and keep many windows and pallets visible is when I am working on typefaces in FontLab. 6. Vandercook 219 proof press. 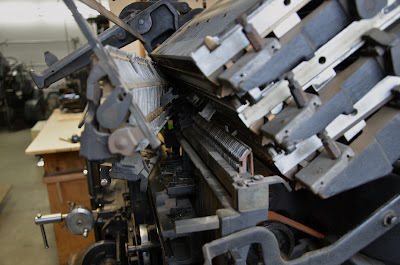 This is the press on which the majority of our letterpress work is printed. It’s slow as letterpresses go, but it’s dead accurate in registration and inking. Of late, I have tended to keep this press set up for printing from photopolymer plates and have been using Glenn Goluska’s Universal I (which has an adjustable bed) for printing from wood and metal type. I’ve had this press since 2000, and my evolution as a book designer owes much to my experience operating it. I like to keep it close by, so it lives right in my office. 7. Poster from Hatch Show Print in Nashville, which I visited this past fall. 8. A microscope. On long-term lone from the Physics Department at a nearby university. A very useful tool for close examination of type. 9. Nipping press. Used in hand-binding books. 10. The day’s stack of incoming unsolicited manuscripts. As well as designing and letterpress printing, my role at the press includes selecting and editing the books on our trade list. We receive anywhere from two to five unsolicited manuscript from authors and agents every business day. We try to answer everyone within about six months, but it is difficult to keep up with the volume of submissions. Perhaps one or two books are selected from this manuscript pile out of the ten to twelve trade books we publish each year. This means that I write scores of rejection letters every month. I sometime feel like I say ‘no’ for a living. It is by far one of the least fun aspects of my job. But every once in a while I stumble across a gem in the pile and get the privilege of writing a letter which exclaims a hearty YES! 11. G. The giant plywood G which hung outside our previous location, next door at One Church Avenue. I’ve been spending a fair amount of time working my way through the various problems that must be resolved with our Model 31 Linotype before it can be run, starting with the assembly mechanisms and keyboard. There was a jam of matrices behind the escapement mechanism that had to be cleared. If you have understand the Linotype, this photo will mean something to you and you’ll shake your head in sympathy. If not, trust me, this is a picture you are better off never having the opportunity to take. Nothing that a six-hours tear down couldn’t resolve, though, with parts laid out and numbered on the floor like a trail of bread crumbs. Now that I’ve got this problem fixed I’m into more normal issues, like a sticky keyboard. Progress, but I’m still a ways off from trying to cast a slug. Truly like this post and the creative way of labeling and explaining all of the elements in the scene. Music is an important part of any workplace...I would like to know what those CDs on the desk are! After having seen your office in person, I love that explained what's in it. I always wondered why you had a microscope. Now I want to look at some of my wood type close up! Gaspereau Press is a Canadian literary publisher and printshop established in 1997 by Gary Dunfield and Andrew Steeves. Gaspereau Press publishes some of Canada’s most original and innovative authors and is dedicated to editing, designing and manufacturing their books in a fashion that honours their content as well as the great humanist tradition of printing and publishing. Employing a wide range of modern and antiquated production techniques and technologies, Gaspereau Press creates books that marry function and form. From limited-edition letterpress projects to Smyth-sewn trade paperbacks with handprinted jackets, every project carries some trace of the human mind, eye and hand. The result is a unique publishing list of award-winning books – affordable, beautiful, and designed to endure.